We manufacture 25,000 litre water tanks from high quality industrial strength MDPE (Medium Density Polyethylene). 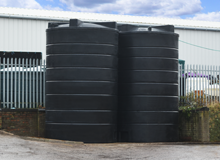 This tough plastic water tank is suitable for agricultural, commercial and industrial applications. Made from a one peice mould, these tanks come fitted with lifting eyes to make unloading and moving the tank easier. These above ground water storage tank are ideal as sprayer tanks, rainwater tanks and potable water storage. These tanks will be delivered using a large lorry. As the buyer, you should ensure there is safe, adequate access and provide your own off loading facilities. The off loading facilities should be suitable for heavy items; forklifts, cranes or Hiab's are suggestions. If you're in any doubt about off loading, please give us a call and we'll help find the most cost effective solution.